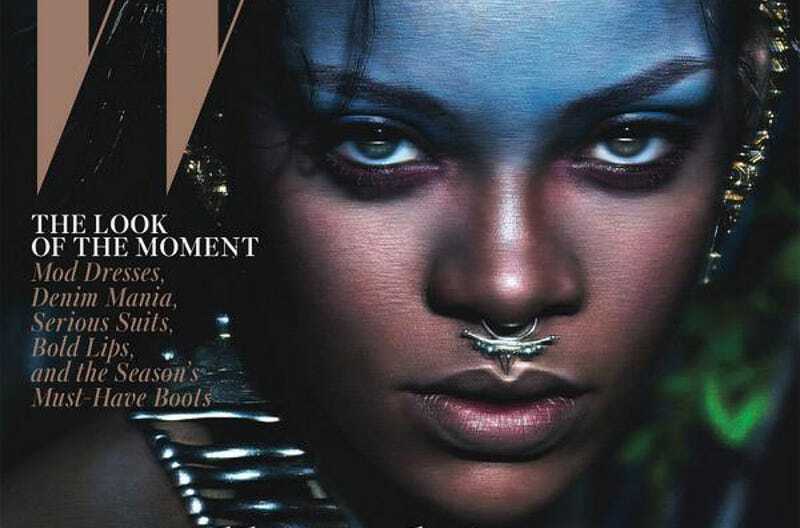 Is Rihanna's W Magazine Cover a Cause for Debate? Rihanna poses beside Iman and Naomi Campbell for W magazine's September issue and it is a joy. Drenched in Balmain, the stylish trio personify black beauty across three age groups, countries and are très glamour. Rihanna’s solo fashion story is something else. What, I'm not exactly sure. When fashion draws on other cultures to for inspiration, the interpretation can get dicey. For example, we've talked about fashion stories misusing Native American headdresses or blackface on white models before. Now, I present you, Kinja, with Rihanna's latest fashion story for W, below, drawing on what appears to be the Inuit culture, hipster septum piercings and Indiana Jones and the Temple of Doom. What do you make of it? Because I'm not sure. She looks gorgeous, but that's beside the point. What do you make of the cultural cues that comprise Rihanna's looks, as styled by W. Is is appropriate? Is it inappropriate? Where is the line for cultural inspiration and straight jacking drawn? You tell me.